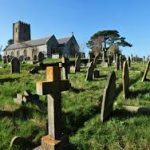 Do you avoid graveyards? Are you reluctant to attend funerals? Maybe you try not to think about death? Some people feel a sense of dread when the subject comes up. They see it as a grim horror yet it crops up in their dreams. This suggests a fear of death. Research finds that about 30% of people have a conscious fear of death – and many others an unconscious one. In this state of mind, the world seems precarious and dangerous. We don’t feel at home in it. So how can we better deal with the prospect of dying? How can we conquer a fear of death? Which ring true for you? A dread of personal extinction seems to be relevant to numbers two and four. A concern for others seems to be relevant to numbers one and five. And a fear of something aversive seems to be at the heart of numbers three, six and possibly seven. Death is an inevitable fact of life. As many realise, coming to terms with a fear of it requires a sense of well-being. The Stoic philosophers believed that learning to live well is to learn to die well. If so, overcoming anxiety about death is to do with living one’s life calmly and happily. In other words, experiencing something higher than a worldly ordinary state of mind is necessary. Many things in life can jolt us from a lower state of awareness to a higher consciousness. The prospect of bodily death is one of these. In Buddhist teachings, a higher level of consciousness is found in the practice of mindfulness meditation. One learns the skill of bringing one’s attention to whatever is happening in the present moment in a calm way, not jumping to any emotional judgment. Observing objectively the nature of objects exactly as they are, without adding to them, without elaborating upon them, without interpreting through the screens of subjective evaluation and commentary. As a result, such things as fear, like fear of death, do not control the person. Likewise, philosopher Martin Heidegger describes a lower state as one of ‘forgetfulness’ as being absorbed in idle chatter, and losing oneself to the concerns of the everyday world. It is in some sense forgetting our equanimity and confidence. In this lower state of mind, we tend to fear the unknown. Then every act of travelling from place to place arouses feelings of nervous apprehension especially if we know little about the destination. And life after death is a case in point if we have no knowledge of this as a destination. In contrast Heidegger describes a state of mindfulness when one marvels not about the way things are but that they are, and the mind focuses on one’s responsibility for one’s own being and one’s personal choices moment by moment. According to psychologist Abraham Maslow, ‘D-cognition’ (deficiency cognition) is seeing things around us in terms of any unmet needs e.g. for money, status, or affiliation. In my view, it is mistakenly considered by natural science to be the only level of the mind. On the other hand, ‘B-cognition’ (cognition of being) is a receptive and purposeless state seeming to encompass in a holistic way all that there is. It sees things as they are in themselves – not as they serve human needs or in comparison with other objects. The values of this stage are perceived as `out there’ and absolute. These values include wholeness, perfection, truth, justice, aliveness, richness, simplicity, beauty, goodness, playfulness, and self-sufficiency. Swedenborgian writer, Harry Barnitz contrasts a false and true self. The false self can be thought of in terms of superficial desires, attachment to possessions and to accomplishments, mistaken ideas, natural anxieties, fear of aversive experiences, being taken in by appearances, and being prone to less than honest ways of speaking. This is living fearfully. The basic need for self-preservation that humans share with animals is one of the most basic anxieties of the lower mind. On the other hand, he says there is a higher mind of the true self. An intuition there is this goodness behind the universe. This is knowing the reality of love, not as a passing pleasure or emotion, but as the very meaning of being alive. The spiritual existence of concern for others reveals the existence of the Self. Studies show that devoutly religious individuals tend to have less death anxiety. Most religions teach we have an immortal soul implying continuing consciousness beyond the death of the body. Previous Previous post: Kindness – What hinders it? Next Next post: Inner growth – What changes in us?